The 300 thread count Harmony Collection is made with 100% satin Egyptian cotton. 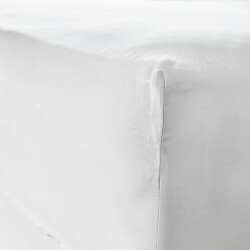 This pure white fabric provides a soft finish with a luxurious feeling of comfort. Finished with an attractive raised blue edging. The simple, pure white cotton of the duvet covers, flat sheet and Oxford pillowcases make this Collection particularly elegant and durable. The pure white cotton has a fresh delicate feel against your skin at bedtime.